Angelina Jolie is planning to make a biopic about Catherine the Great, the celebrated empress who ruled Russia for most of the second half of the 18th century. 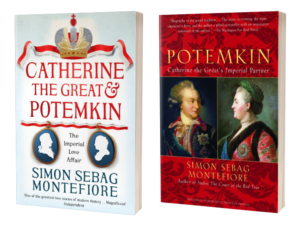 According to a statement from Weidenfeld & Nicolson, part of the Orion Publishing Group, Jolie’s production company Jolie Pas has bought an option on Simon Sebag Montefiore’s book, CATHERINE THE GREAT & POTEMKIN: THE IMPERIAL LOVE AFFAIR, which was published in 2000. Born in Prussia under the name Sophie Friederike Auguste von Anhalt-Zerbst-Dornburg, Catherine became empress of Russia in 1762, after a coup against her husband, Peter III. She would go on to become the country’s longest-ruling female sovereign, dying in 1796. Potemkin was arguably the best known of her court favourites, playing a key role in Russia’s imperial ambitions in the southerly Caspian sea region, conducting a major war against the Ottoman empire and accomplishing the annexation of the Crimean peninsula. He became Catherine’s lover in 1774, shortly after the displacement of an earlier favourite, Count Orlov, and retained high office even after their affair ended. His name is associated with both the “Potemkin village” – the practice of setting up fake neighbourhoods to impress visiting VIPs – and the battleship that had a famous mutiny in 1905. No details have emerged of what credits Jolie might take in the production. The role of Catherine would presumably be ideal for her, though her acting career has largely taken a backseat to her directing ambitions in recent years: she is currently working on her third film as director, By the Sea, after releasing Unbroken and In the Land of Blood and Honey. However, she has taken an acting role in By the Sea, opposite her husband Brad Pitt.